A few weeks back, I got a request to post a tutorial and/or tips piece on Saturator. Since there's already a lot of coverage for Ableton's nifty digital distortion device, I decided to go one better and create a preset that utilizes a more exotic attribute of Saturator: Waveshaping. An interesting detail about waveshaping is that it works best on audio with very little harmonic content, like sine or triangle waves - or strongly lowpass filtered source material. A few years back, I did an Instrument Rack for Live 6 that used this technique as a synthesis tool. Of course, that was ages ago and I've refined the technique a bit more, so I decided to revisit the production methods and whip up a new patch: Wavescraper. Another thing you should know about waveshaping (and distortion in general) is that it 'likes' monophonic material. Chords of almost any kind wreak havoc with the effect, due to intermodulation, so I made Wavescraper a monosynth. For maximum compatibility, I started with a triangle wave in Simpler. You could easily swap this out for an Operator if you're going to tinker - and if you do, please read the important note below. From there, I added the Saturator. Since we're using material with few harmonics, the waveshaper tools now function as synthesis parameters. Accordingly, I created a few macros - drive, chaos and color - to manipulate the sound in relatively conventional ways. As I tinkered with Wavescraper, I realized that it could easily be used for dubstep bass sounds. Since the volume of the input signal affects the behavior of the waveshaping effect, I added a tempo-synced amplitude LFO, which is controlled by the Wobble macros. To sweeten the output, I included some chorusing and delay, since these are pretty light on CPU resources. 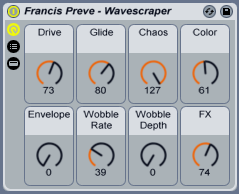 Drive: Governs the overall amount of waveshaping applied to the triangle wave source. Chaos: Modifies the linearity, curve and depth of the waveshaping algorithm. IMPORTANT NOTE: If you decide to tinker with the Macro mappings, turn your speakers' volume down. The Saturator drive amount is tied to its output in an inverse manner. If you unmap or alter this setting, you could blow your speakers - or worse, damage your hearing. With this statement, Francis Preve and this blog hereby indemnifies itself against any damage caused by altering the settings of this preset. - I'm posting the patch within a Live Set, as opposed to a Live Pack or single preset, so you can hear the patch with example clips and twist the macro knobs to see what's what. If you like it, then hit the preset save button on the macro and add it to your Library. - There are three examples: A percussive plucky loop, a gliding lead, and a typical dubstep bass riff with automation. These show the range of the instrument. - The patch will run on Ableton Live 7.0.18 or higher. - What you see/hear is what you get. I tested it on a couple of systems and the Zip file works as expected. Very Nice article and great job on the scraper mate. how can you change the wobble? But why don't put, or at least in the "important note", don't advice to use a limiter? At least you'll not blow your speakers!!! top work. lots of fun. Hi Francis thanks alot for sharing the knowledge! A tip/reminder is to next time include the Marco descriptions as Live Notes on the device preset itself. Easy to overlook this fantastic function of Live, which is quite beneficial to those who wish to educate people. Cheers! You REALLY are too kind My friend. Academik - Exclusive Preview: William A - "Alpha"